In 1776, when the United States was declaring its independence, there had yet to be a written account of what is now the central Oregon coast. 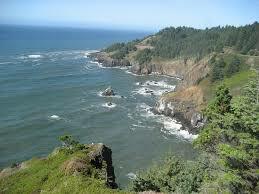 In 1778 Captain James Cook passed by the southern coast, naming Cape Perpetua, and then headed northward passing Yaquina Bay to Cape Foulweather. Cook, inspired by the rough weather he encountered, named Cape Foulweather.